Sparkle Shack brings life to your parties, festivals, and corporate events throughout Canada. We offer a professional service as well as quality to make sure you get the very best experience suited to your very special event. “Free Hand Painting Face and Body Painting“ Sparkle Shack designs are ethereal and full of magic! Airbrush body and face-painting can be a fantastic addition to your marketing plans! 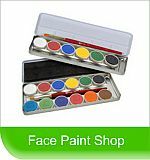 With the careful use of non-toxic, and specially developed body-paints, artists can stencil or free-hand striking designs! These paints are water-soluble so that they may be removed very easily when desired.